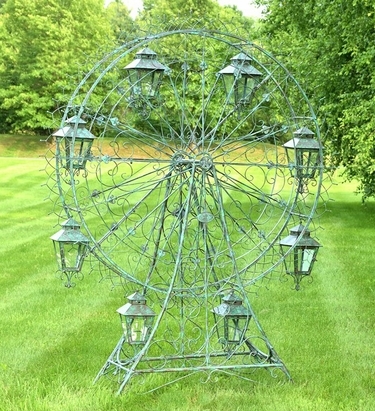 Get ready to attract and impress all your garden visitors, store customers, and maybe even wedding guests with your very own Large Ferris Wheel Display! The GardenFun "Atlantic" Ferris Wheel is manufactured using high-quality iron making it structurally sound and incredibly easy to assemble. The wheel is now powered or driven by the wind, but does actually rotates by has if desired, spinning the eight hanging lanterns as it makes its way around. These lanterns are equipped with glass panels to allow any light from a candle or a battery operated glow to radiate throughout, looking truly magnificent at night. It's also possible to use the lanterns to display various smaller plants and flowers. This large Ferris Wheel is a unique sculpture that will capture the imagination and impress all. Available in three gorgeous finishes. Ships via Freight Truck included.